It's only on looking back at these pages that I realised I'd used two self-portraits in a row. The photo on this one is my current Facebook profile picture...sometimes looking at photos like this over a period of time can show just how much things have changed. 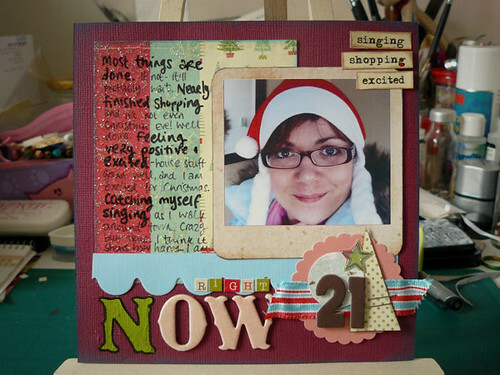 My scrapbooking tip for today? Use a dual-ended pen to write your text, using the thicker end for the key phrases. Makes the text look much more interesting than a simple paragraph, especially if you are writing short thoughts rather than a long story. This is a less flattering portrait (no-one looks good on a convex surface) but this is the first year I've actually remembered to take a photo of my reflection on a bauble. Except, of course, I only have mini baubles on the tree this year so I had to hold one instead. 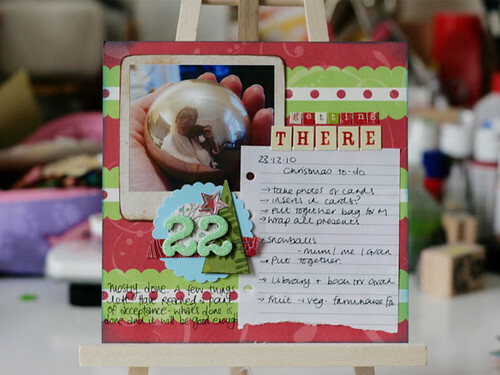 If you'd like to see some better examples of bauble self-portraits, check out this Flickr group.